In this special From the Forums post, we’re spotlighting a creative father-daughter duo. Nine-year old Sienna and her father D.R. 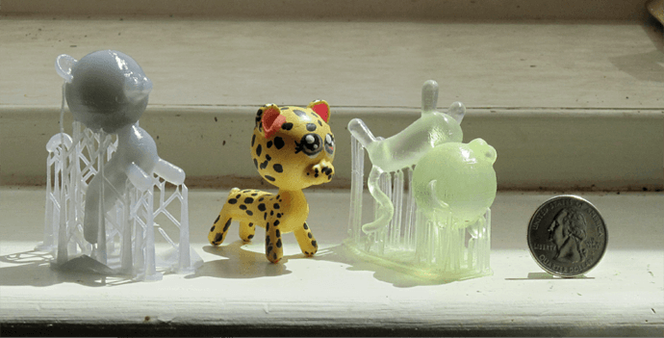 have been making a small stampede of 3D printed animals (when D.R. isn’t busy animating and Sienna isn’t busy doing homework). D.R. uses his daughter’s sketches as a basis for their animal models, which he then prints on his Form 1 SLA 3D printer. D.R. Greenlaw and Sienna Kai Greenlaw are a father and daughter who like to collaborate on art projects. D.R. draws comics and makes animated shorts with his wife in their private studio Little Green Dog. D.R. is also an animator for DreamWorks Animation. Sienna is an artist in her own right. She likes to draw, write stories, and make toys. Her favorite subject matter is animals. We got in touch with them to ask about their ongoing collaboration. D.R. and Sienna show us how parents and children can create a fun and meaningful collaboration using 3D printing to bring ideas to life! D.R: I guess we began when Sienna was a toddler and just learning to talk. Some of our conversations became dialog for a comic strip I was drawing. By the time she was four, Sienna was drawing prolifically and we started creating comics and toys together. We ordered our Form 1 during the Kickstarter campaign and Sienna already had ideas for animal toys when I showed the demo video. When she mentioned this, I thought it would be a great opportunity for lessons in the process of design to production. She was six when the printer arrived and she immediately presented her 'Cheetah' design as our first 3D print project. For Sienna, what are some other ideas you have for projects? Sienna: Maybe a dragon or a bison because I love imaginary creatures and animals. Do you like to make sculptures out of other things too? Sienna: Yes, I like to play with my 3D pen, Sculpey, [and I like to do a lot of] felting and sewing. Your Dad says you're excited about making a printed pet store. Tell us more! Sienna: I really like 'pet shops' (a small animal toy) and I have been collecting them since I was three years old. They inspired me to create my own animal toys. What's your next collaborative 3D print coming up? D.R: Sienna wants to make a dragon or a bison. I want to start making dioramas based on my comics but I'll probably be helping [Sienna] with her dragon or bison first. Have you always been this excited about 3D Printing? Sienna: Yes, I think 3D printing is very exciting! I like it because when I have an idea, I can draw it on a piece of paper, and then I make my idea into 3D shapes on the computer. Then I can print it and my idea becomes real. Sienna: The King Cheetah and Red Fox. I like the King Cheetah because they have pretty stripes and dots, and I love their body structure. I like the Red Fox because their beautiful red coat shines in the sun. D.R. : They're all fascinating to me. We live near the Los Angeles Zoo and we visit often to sketch the animals there. At the moment, I like drawing the exotic birds. At home, I always like drawing our cats. Sienna, do you have any tips for other kids working on projects with their parents or other grown-ups? Sienna: Figure out together what you're going to do first then draw it on paper. D.R., do you have any tips for parents working directly with their kids or designing for them? D.R: When collaborating on a project, you can come up with ideas together but as the parent you should establish a few guidelines before you begin, bearing in mind what's practical and actually doable. And of course, you should explain the safe and responsible way to use art tools and supplies. Beyond that however, don't micro-manage the project- that's not fun for anybody, kids or adults. It's important to allow kids to play and have fun with what they're working on. It's okay to make suggestions when they run into problems but they should be allowed to make mistakes, explore, and come up with their own solutions. Remember, a child's intuition is very different from an adult's. I'm often surprised by the inspired twists and turns it can take to reach a goal. Happy Printing, Greenlaw & Sienna!